Alexander Abt's career started auspiciously with a silver medal at the 1991 World Junior Figure Skating Championships. Russia’s Alexander Abt has had so many injuries that you’d think a black cloud was hanging over his head. His career started auspiciously with a silver medal at the 1991 World Junior Championships and he was a strong contender at the Russian Nationals starting the next year, coming in fourth in both 1993 and 1994. But the injury bug started biting in 1995 when he injured his hip and couldn’t compete at Europeans. The next year, Abt wrecked his right knee at the NHK Trophy, missing the remainder of the season as he recovered from knee surgery. But the worst was yet to come. While skating in a Russian team exhibition in Mexico City in August 1996, Abt fell awkwardly coming down from a jump and crashed into the barrier with his leg twisted the wrong way and his blade imbedded in his right thigh. A broken leg and severely torn muscles required surgery which kept him in a Mexican hospital for two weeks as doctors debated whether he would ever walk again, much less skate. But Abt proved them wrong, although he was completely off the ice for six months. He was forced to relearn all his jumps before he could compete again, but returned in time for Russian Nationals, finishing back in the pack. Abt performed well for the next few seasons, but then had to go under the knife again in 1998 to rebuild his left knee, again missing the Russian Nationals and failing to make the World team. Last year, he underwent more surgery; to remove a cyst from his sinuses after a sinus infection at the 2002 Europeans had left him so weak that he collapsed in the kiss and cry. Even with all these setbacks, Abt has had an impressive career. He’s held his own while competing against three Olympic champions and two World champions from his own country. His first major breakthrough was a bronze medal at the 1998 Europeans. Although he had finished third at both Skate America and the Cup of Russia that season, his fourth place finish at the Russian Nationals left him as the fifth man on the Russian team behind Alexei Yagudin, Ilia Kulik, Evgeny Plushenko, and Alexei Urmanov. Assuming his season was over, Abt went to Bulgaria on holiday. At the last minute, he got a call to replace Kulik and Urmanov, who were both injured, and arrived in Milan having not practiced for 2-three weeks. But he skated well, allowing the Russian men to sweep the medals. In the last three years, Abt has made the team be medalling at Russian Nationals, finishing with two fourths and finally the silver medal this year. He’s also reached Worlds, finishing sixth in 2000 and eighth in 2001. He finished fifth in the 1998 Grand Prix Final and fourth in 2000. Abt has also won medals at several of the Grand Prix events, including a bronze at Skate America this season. At the 2002 Olympics, Abt placed 5th overall, not far from the tails of his fellow countrymen. Through it all, Abt has remained constantly upbeat and a real fan favorite. “I love everything about skating,” Abt said. “I skate so people will look at me, not talk to their neighbor. It’s the clapping that makes me happy.” So it’s no surprise that Abt’s favorite skater is Canadian crowd-pleaser, Kurt Browning. “He’s a real professional,” said Abt. 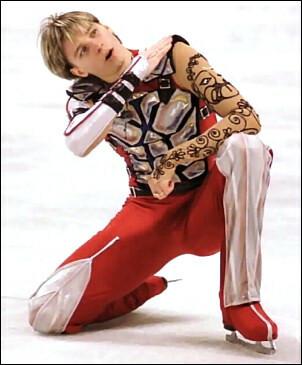 “He looks so natural on the ice, like a fish in the sea.” But Abt has created his own style, skating to a wide variety of music, including a tango, Middle Eastern music, “Riverdance” and “Gladiator”. “Every year I try to change to a different style,” Abt explained. “Sometimes an idea just comes to me to make a program.” This year he is using Armenian music by Are Gevorkian for the short and Rachmaninov’s Piano Concertos 2 and 3 for the free skate. Rafael Arutunian choreographed the programs with assistance from Sergei Petukhov for the short and S. Brown for the long. Abt said he likes all kinds of music and doesn’t really have any favorites, either for skating or for relaxation. Abt began to skate when he was about six when his grandmother took him to group lessons. When the coach told her he was too slim to be a hockey player, she bought him figure skates. His first major coach was Sergei Volkov, the Soviet Union’s first world champion, who worked with the youngster in Moscow until his death in 1991, after which Abt began working with Arutunian, with whom he still trains. Due to lack of ice time in Russia, Abt has been training in Lake Arrowhead, California since the summer of 2001, where he works for about three hours daily on the ice, with another hour of off ice conditioning work. Abt is now landing the quadruple toe loop/triple toe loop combination consistently, performing the combination successfully in all three rounds at the 2002 Europeans. He is also using the triple Axel/triple toe loop in his long program and is working on the quadruple salchow and quadruple flip. He had been landing a quadruple flip consistently before he was injured in 1996.